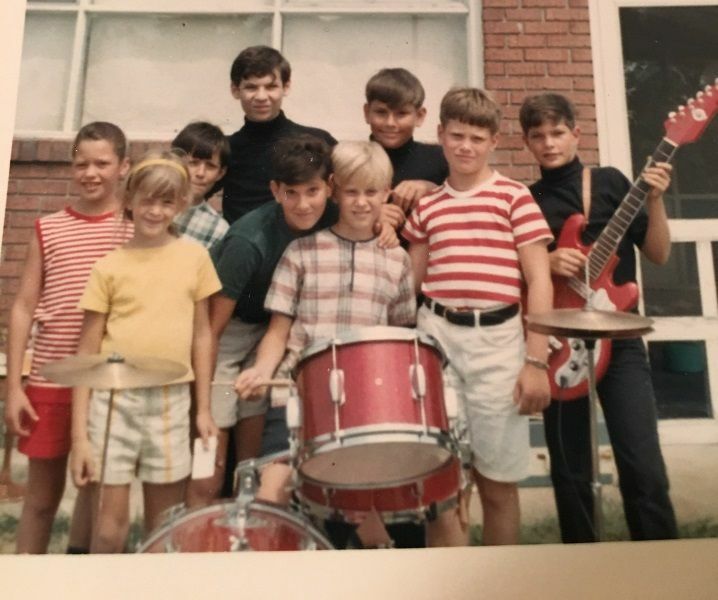 This photo from the summer of 1966 was sent to me earlier today by the guy in the red and white striped shirt in the photo. It is now the second picture I have of my first kit. The other is black & white and the drums are largely blocked from view. This is the kit I got in the fall of 1965 from the Sears & Roebuck catalog. It was my first introduction to Pearl Drums which was not yet a brand name when I got them. There was no logo or brand name on them. Not Sears, not Silvertone, not even Pearl. But, on the underside of the hi-hat foot board "Pearl Drum Company LTD Japan" was in small raised letters. Not long after the photo was taken I got the matching floor tom tom. That little crummy cymbal that came with the kit also got replaced with a 20" K Zildjian from Istanbul. I think this was taken after a rehearsal of our new band The Undertakers. I don't know where the other two members were and those are some of the kids from the neighborhood. The little blond guy wanted to be photographed behind the drums so I let him. Unusual for overprotective me. Funny, I still play with the same angle on the mounted tom tom. Last edited by Ron Gerber; 02-09-2019 at 10:28 PM. Fun. I like your mod band members. EDIT: Decided to share as well. Last edited by dale w miller; 02-10-2019 at 08:20 AM. That's awesome Ron! Great memories! Here's mine from 1976! My first kit I paid 50.00 from my hard earned paper route money! Nice Dale! I'm thinking all the lower end kits back in the day were all red sparkle! Funny thing, my current kit is red sparkle and still enjoy the look! Dale, that looks like it's out of the same factory. The "matching" floor tom tom from Sears didn't really match. It was split lugs while the rest of the drums were double lugs and while the flecks and color of the wrap looked the same it had a different gloss to it. TM, I also remember those kits as mostly red but the catalog offered the kit in blue sparkle as well. Blue is my favorite color so don't ask me why I chose red but I did. I'm gearing up for a new kit and have considered a 4 piece Ludwig red sparkle. I can probably do it too but the Crimson Burst Session Studio Select has totally captivated me. I hope they continue offering the second floor tom tom until I'm in shape to buy that kit. I was hipped later to the fact that red drums sound better. Now that was a cool story. Very nice of the red/white stripe guy to send you the pic also. My first kit also came from Sears. It only had paper heads. The kick drum was quite the safety hazard. It actually had a place for a certain wattage of light bulb to insert for illuminating the psychedelic swirl on the head. My first kit was a family shared kit, bought in pieces from second hand stores. The kit I got was more of a knock off of Ludwigs in the wake of The Beatles/British Invasion and everything else going on in pop music at the time. The drums had re-rings so I assume the shells were three ply. Definitely cheap Philippine mahogany. The red sparkle wrap had an over-all dull appearance. Not like Ludwig's wrap. 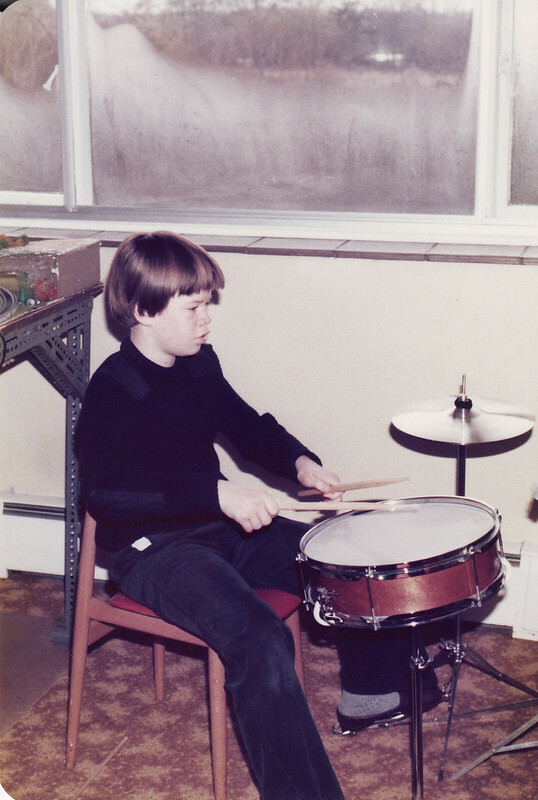 Money was a factor for my dad at that time so we tried going the used route for better drums but finding anything in good condition proved impossible. The demand in 1965 was incredible. That's how I ended up with drums out of the Sears catalog. Last edited by Ron Gerber; 02-11-2019 at 10:24 AM. Luckily I grew out of the tiny kit faze. Couldn't afford one back then.